So where do I start with this one? It’s an album with an identity crisis and it’s aimed at young children and their parents, so I’m really out on both counts, although there might be some debate about the first one. 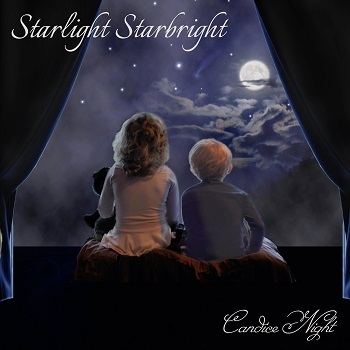 Candice Night shies away from referring to it as a lullaby CD, preferring the term ‘music to dream by’ which is probably a better reflection of the content. It’s a pretty varied selection of originals, a traditional song reinterpreted (Rock A Bye Baby”), a standard (Annie’s Song”) and some Disney songs, which is held together by the sheer quality of Candice’s voice, the playing and the arrangements. And, just in case you didn’t know, Candice’s collaborator on the project is her husband Ritchie Blackmore, yes that Ritchie Blackmore, playing a lot more quietly than he did in the seventies and eighties. The musical settings throughout the album are exquisitely delicate, featuring acoustic guitar, assorted woodwinds, keyboards and violin. And most definitely no drums. The cover of John Denver’s “Annie’s Song” (the first single from the album) is a perfect example of everything that’s good about “Starlight, Starbright”. The gently-picked, almost medieval, acoustic guitar, subtle strings and breathy backing vocals, sit perfectly under a close-miked vocal that highlights the perfection of Candice’s voice. It’s a lovely version of a great song and will surely find its way on to the Radio 2 playlist, but where does that leave the rest of the album? There’s no doubt that Candice has a superb voice and the understated arrangements help to emphasise its clarity and purity but the album feels like a compromise. If you took away “Annie’s Song” and possibly the Blackmore/Night original “Misty Blue”, this would be a very high quality offering for children; maybe the lullaby concept was right all along. It’s easy to appreciate Ritchie Blackmore and Candice Night on a technical level, but it’s difficult to be moved by something largely aimed at infants. As an added bonus, this is in an enhanced CD format featuring videos for “Once in a Garden” and “Lullaby in the Night”. “Starlight, Starbright” is out on Minstrel Hall (MHM 0207) on April 8th.